The V-Moda Crossfade LP over-the-ear headphones are the result of an over 4-year effort to provide music enthusiasts with quality sound, unbeatable durability and a style all their own. After spending some time with my new set of “cans,” I am now able to tell you whether or not they were successful in that endeavor. As a big music fan that listens to a very diverse range of musical genres, I wanted to get a pair of high-end over-the-ear headphones that I could use every day, that would also be great at noise isolation while traveling and that would deliver high-fidelity performance that would allow me to hear every note of music. 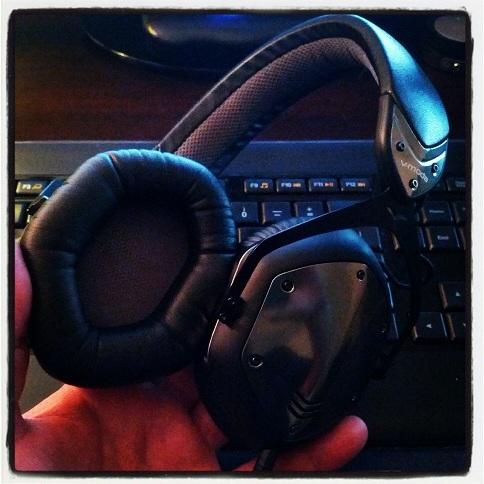 I purchased my pair of the Crossfade LP headphones through Amazon, which I recommend, as you will get them for a better price than buying directly through the V-Moda website. These headphones are stylish as hell. Period. They come in an assortment of colors and customizable metal shields, but I chose to go with the Gunmetal version (pictured). The white ones look too much like Beats by Dre (which I think are overpriced for the quality of sound that you get) and the Chrome was a little too flashy. The Gunmetal was juuuuuust right and better suits my style the most. Also, on more than one occasion I have been stopped and asked about them. Beyond that, there is a beautiful combination of metal and matte finish, coupled with leather, steel and memory foam (cups & headband). Promotional image. My set did not come with additional metal shields. Two tangle-resistant Kevlar-braided cables. One is a standard headphone cord (thicker & slightly longer), while the other cable doubles as a headphone & headset cord for Apple devices, including a microphone and remote control. I tested the smartphone cable on my Galaxy Nexus, and the remote on the cord did not answer calls (seems to only work on Apple devices). However, the mic and headset work fine if you answer calls directly from your phone. Callers said that I sounded clear and that they could understand me just fine. A free carabiner. Due to the bulky nature of the carrying case, this can be used to affix your headphones to the outside of a messenger/carry-on/book bag, etc. 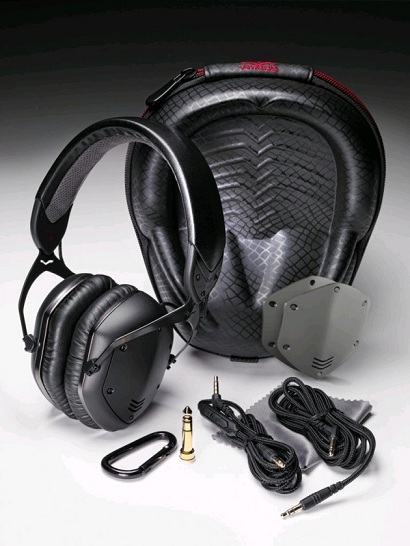 According to V-Moda’s website, the Crossfade LP’s offer “military-grade durability.” I have found this statement to be true in the sense that there is nothing about the build quality that screams “cheap” or “fragile.” Many headphones will feel light and flimsy (i.e., all plastic), or that a bend in the wrong direction will snap them in half. Thanks to the metal that is incorporated into the design, the Crossfade’s have a very nice weight to them, while still feeling light enough concerning wearability and comfort. Connecting the headband to the ear cups are bands of rigid steel. The headband itself is an ergonomic steel flex material that can be twisted and laid flat (although, I don’t recommend it!) before you could reasonably expect any damage to occur. 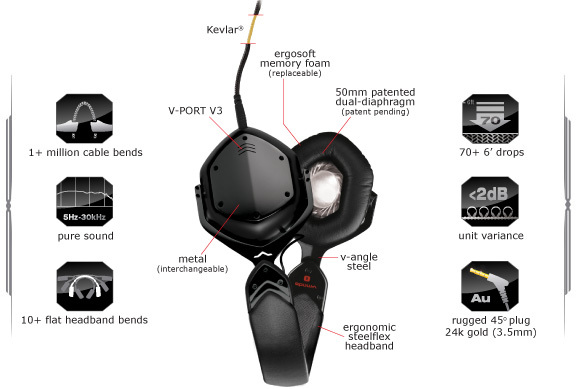 V-Moda also offers a 2-year warranty, in addition to an “Immortal Life Program” in which they will replace any broken headphones (of the same model) for 50% off the price, or a heavy discount on a newer model. To me, this clearly states, “We stand behind our products,” which I much appreciate. Also, thanks to the fact that the cords are detachable, you will no longer have to worry about buying an entirely new pair of headphones just because a cable wears out, gets frayed or damaged. I especially like this, as I am not a fan of the “Y” shaped headphone cords that connect to both earpieces. As a bonus, the cables can double as an AUX cord…for instance, if you want to connect your phone or iPod directly to your car stereo. Another feature design that I like is the fact that each cable has a plug – the one that would connect to your source device – that is at a 45-degree angle. Anyone who has ever had their cord ripped out by merely catching it on something, will appreciate this ‘feature,’ which is intended to prevent accidentally yank outs. 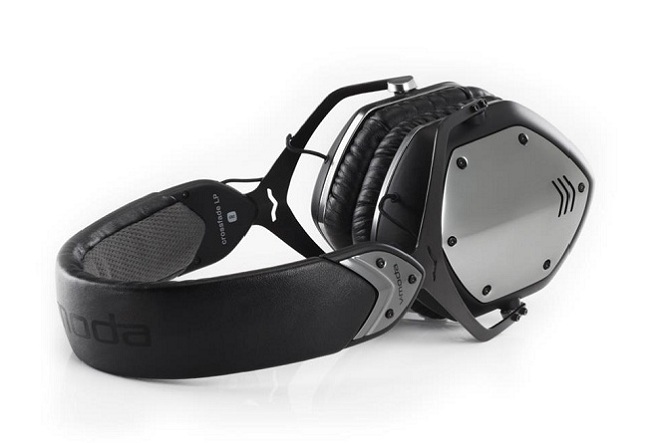 Additionally, you can order any part that you may need through V-Moda…including new cords or even the 50mm drivers, should you need/want to replace them for whatever reason. The earpads on the headphones are surrounded by a very soft leather-wrapped memory foam, as is the interior of the headband. At first, I was a little concerned, as they initially felt tight and slightly uncomfortable after about an hour of wear. However, this began to disappear considerably after wearing them for a few days – thanks to the headband being very flexible – and the headphones started to stretch and mold to fit my head better, in addition to the memory foam. Now, they are incredibly comfortable, and I barely notice that I am wearing them; therefore be sure to allow a few days for them to ‘adjust’ to the shape of your head, and I’m confident that you will experience the same improvement in comfort as I did. I also found that the noise isolation was very good because the earpads rest against your head and not against your ears. This full coverage contributes significantly to the sound isolating properties of the headphones, not to mention the sound quality of the music that you listen to, as your ears are fully encased and surrounded by the soft memory foam pads. Girlfriend Approved! While writing this review, my girlfriend snatched them up for herself. Notice that I say noise “isolating” and not “canceling.” The Crossfade LP’s are not a powered device (like the Bose QuietComfort 15); therefore they do not require a battery or emit a noise canceling wave to block out all ambient sounds. I have found that the noise isolation is quite good and does an admirable job of blocking out most surrounding sounds to a dull murmur at best. I have not had a chance to use them on a plane yet (the real test, in my book), but from my experience so far, I am not expecting it to be an issue. So, if you travel by bus, plane or subway, I feel confident in saying that ambient noise should not be an issue at all with these headphones. 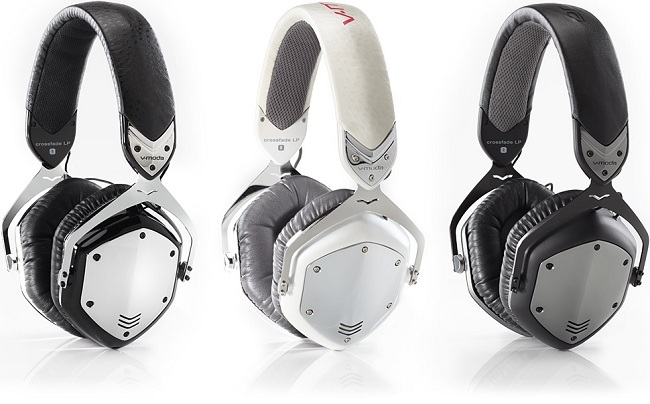 According to V-Moda, they spent four years working with world-renowned DJ’s to develop and engineer the CrossFade LP’s. Was the time and money well spent? When I first received the headphones and plugged them in, I was very impressed by the sound on some tracks…and not so much by others. It appears that the headphones (and their impressive 50mm Dual-Diaphragm Drivers) were originally developed for fans of hip-hop, R & B, dance music and techno, due to what appeared to be a very bass heavy sound. Mind you, I like a nice solid bass response in my music, but the mids also sounded a little muddy and the highs had a slight echo…therefore I was not initially blown away. However, there is a process called “burning in” for a new pair of higher-end headphones. The theory behind breaking in a speaker is that they come from the factory a little stiff. The surrounds need to be stretched and exercised. The best way to do this is to burn them in by playing roughly 24 hours worth of music through them at a normal volume. Some speakers require this, while others do not. Since I had heard that others had experienced the same problem, I set to burning in my pair. On Day 1, I listened to roughly 5 hours of music in my office. Later that evening, I plugged them into my laptop, launched Spotify and left it continuously playing through the night into the morning. The difference in sound quality the next day was nothing short of amazing! 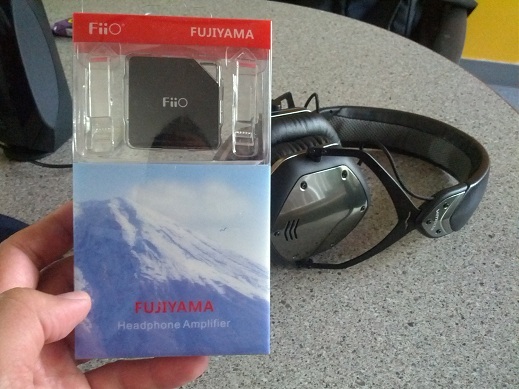 The sound is so impressive thanks to the 50mm Dual-Diaphragm Drivers. After properly burning them in, I could very easily tell the difference between how they sounded out of the box and how they sounded once I had a chance to break them in. The bass was nice and smooth, the mids were very warm and the treble was clean. Also, regardless of musical genre, the headphones sounded wonderful across the board using a flat response (i.e. no EQ). Therefore, if you decide to pick up a pair, I highly recommend (Nay, require) that you properly burn them in before making a judgment on their sound. Once I did, I heard parts of my favorite songs that I didn’t even know existed! The sound difference coming through the headphones was just incredible, trust me on this. Primarily I am an ‘alt-rock’ guy: Phoenix, Silversun Pickups, Vampire Weekend, The Black Keys, Cold War Kids, Young the Giant etc. But I also listen to a lot of jazz, some hip-hop, classical, hard rock and more. However – thanks to burning in the headphones – it didn’t matter if it was Thelonius Monk, The Lumineers, Tool, Bach, Beethoven, Jay-Z or Tribe Called Quest…all of them sounded stellar through these cans. At launch a couple of years ago they sold for $249. Later they dropped to $199. Currently, they can be found online for about $120, due to the fact that a newer version has been released recently. I picked mine up from Amazon for $79, thanks to it being their ‘Deal of the Day’ – an absolute no-brainer at that price – and a 1/4 of what I would have spent for the Bose QuietComfort 15. When it comes to headphones like this, a lot of people do not realize that they were not necessarily intended to be used with underpowered devices such as cell phones and iPods…there is just not enough juice in these devices to push high-end headphones to their full potential. Therefore, please note that the source device you use – whether a laptop, desktop, receiver or smartphone – is going to be the most important factor in how your headphones perform. For instance, my $3000 laptop (apparently) has a crappy sound card, because my other $500 laptop plays music so loudly and well through these headphones that I practically blow my face off. My Galaxy Nexus plays music just fine, but the use of an equalizer makes a BIG difference in the sound…same goes for the difference between the quality of streaming music (i.e. Spotify, Pandora) versus that of higher quality music files that might be saved directly on my phone. Now, for simply listening at work, going for a walk or hitting the gym, you don’t really need to use a portable amp. But if you are going to be in a noisy environment, on a plane or perhaps you just want to provide cleaner and more powerful audio to your headphones so that you can take better advantage of what they are capable of, then I recommend picking one up. The E6 (pictured) and the E11 are rechargeable and you will definitely notice a difference in sound. My CrossFade LP’s are plenty loud for most everyday situations and portable devices, but when I am traveling I prefer to completely block out airplane noise, and other passengers for that matter. Since an amp is an extra device that you are attaching to your smartphone / iPod, it’s a little easier to manage when you are going to be sitting for a bit. However, they do come with a clip and there are a variety of accessories that you can use to attach it to your device to make using one while on-the-go a lot less cumbersome. The Crossfade LP's were absolutely worth the money that I spent and I would recommend them to anyone who is interested in picking up a pair of quality over-the-ear headphones at a decent price. 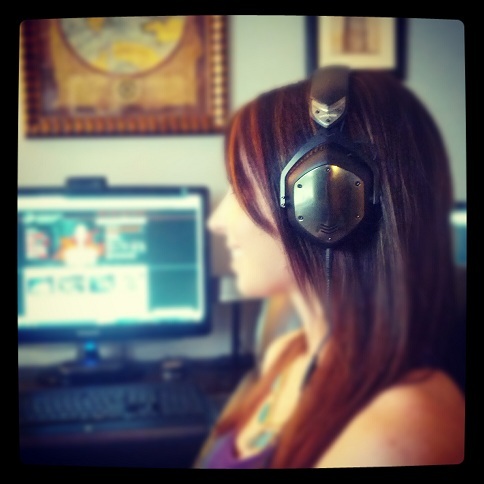 They are great for music, gaming, movies and/or drowning out annoying relatives & co-workers. Previous articlePodcast 403: Yo Mama!